Another classic canoe-stern Benetti motor yacht comes on the market as John Jacobi at Kardinal tells me he's listed the 34.1m Le Mirage for sale. Built by Benetti in 1969, a major refit in 2006 saw Le Mirage become a very successful charter yacht, accommodating up to 10 guests in a master suite, VIP stateroom and three twin cabins. 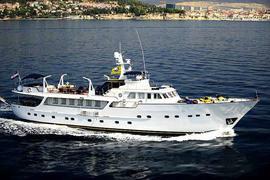 Powered by twin 465hp Detroit Diesel engines, Le Mirage cruises at 11 knots and is on the market asking €2.4 million.